Designed by Emerson Matsuuchi (designer of the Century game series, Reef, and Specter Ops)Metal Gear Solid: The Board Game is a fully cooperative, miniatures board game. Following the story of the first Metal Gear Solid video game, players take on the roles of Solid Snake, Meryl Silverburgh, Dr. Hal “Otacon” Emmerich, and Gray Fox the Cyborg Ninja. They’ll need to use their unique skill sets to avoid detection as they complete objectives across multiple campaign scenarios. Featuring a highly dynamic A.I. system and sandbox gameplay, missions can be completed in multiple ways and will always play out differently. 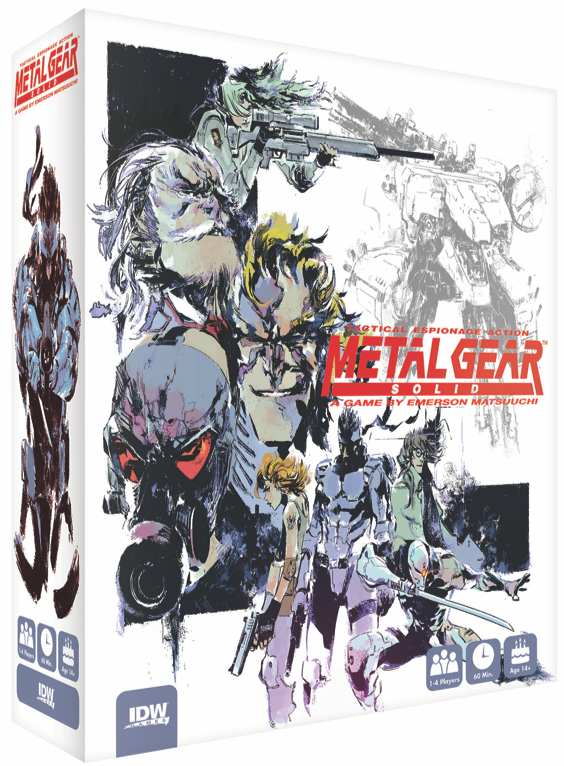 For more information on Metal Gear Solid: The Board Game, follow IDW Games on Twitter and like their Facebook page, where fans can discover art and gameplay development ahead of the game’s release in 2019. Sign up for the newsletter HERE to be alerted when the game goes live! IDW Media Holdings, Inc. (OTCQX: IDWM) is an integrated media company, which includes the award-winning IDW Publishing, IDW Games, IDW Entertainment, Top Shelf Productions, the San Diego Comic Art Gallery, and CTM Media Group Inc., one of North America’s largest distributors of tourism information. Founded in 1999, IDW Media stands proudly at the forefront of visual entertainment, showcasing a formidable library of world-renowned licensed brands and creator-owned original IP. Its diverse array of comic books, graphic novels, and live-action television shows deliver enjoyment to fans of all ages. ← It’s #Wayward Wednesday! Time for another character reveal!